The beautiful hydrangea is good for more than just show. The Cherokee tribe first used it to support the health of the kidneys and introduced it to early American settlers who used it for similar purposes. With its bitter flavor and solvent properties, hydrangea nourishes the urinary system and provides the body with key nutrients including silicon, flavonoids, resins, and saponins. 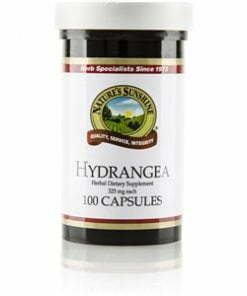 Each Nature’s Sunshine capsule consists of 325 mg of hydrangea root.